Aortic regurgitation is a heart valve disease in which the aortic valve does not close tightly. This allows blood to flow from the aorta (the largest blood vessel) into the left ventricle (a chamber of the heart). 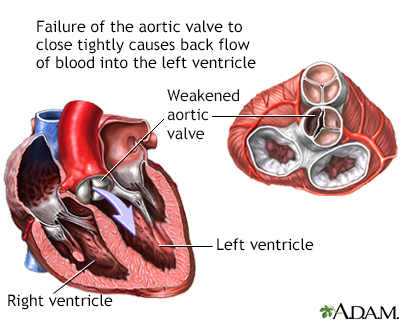 Any condition that prevents the aortic valve from closing completely can cause this problem. When the valve does not close all the way, some blood comes back each time the heart beats. When a large amount of blood comes back, the heart must work harder to force out enough blood to meet the body's needs. The left lower chamber of the heart widens (dilates) and the heart beats very strongly (bounding pulse). Over time, the heart becomes less able to supply enough blood to the body. Aortic insufficiency is most common in men between the ages of 30 and 60. A chest x-ray may show swelling of the left lower heart chamber. Lab tests cannot diagnose aortic insufficiency. However, they may help rule out other causes. You may not need treatment if you have no symptoms or only mild symptoms. However, you will need to see a health care provider for regular echocardiograms. If your blood pressure is high, you may need to take blood pressure medicines to help slow the worsening of aortic regurgitation. Diuretics (water pills) may be prescribed for symptoms of heart failure. In the past, most people with heart valve problems were given antibiotics before dental work or an invasive procedure, such as colonoscopy. The antibiotics were given to prevent an infection of the damaged heart. However, antibiotics are now used much less often. You may need to limit activity that requires more work from your heart. Talk to your provider. Surgery to repair or replace the aortic valve corrects aortic regurgitation. The decision to have aortic valve replacement depends on your symptoms and the condition and function of your heart. You may also need surgery to repair the aorta if it is widened. Surgery can cure aortic insufficiency and relieve symptoms, unless you develop heart failure or other complications. People with angina or congestive heart failure due to aortic regurgitation do poorly without treatment. You have symptoms of aortic regurgitation. You have aortic insufficiency and your symptoms worsen or new symptoms develop (especially chest pain, difficulty breathing, or swelling). Blood pressure control is very important if you are at risk for aortic regurgitation. Lindman BR, Bonow RO, Otto CM. Aortic valve disease. In: Zipes DP, Libby P, Bonow RO, Mann DL, Tomaselli GF, Braunwald E, eds. Braunwald's Heart Disease: A Textbook of Cardiovascular Medicine. 11th ed. Philadelphia, PA: Elsevier Saunders; 2019:chap 68.